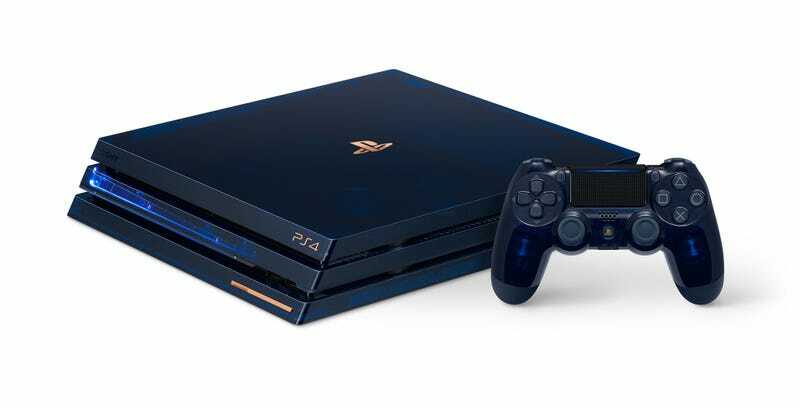 To commemorate 500 million PlayStation consoles sold over the last couple of decades, Sony will be bringing back that 90s styling and releasing this blue, transluscent PS4 Pro. Both the console and controller are see-through, letting you peek through the casing to see the guts inside, while the surrounding plastic is a very fetching shade of dark blue. There’s also a bronze plate on the front with the serial number on it. The limited edition bundle includes a 2TB PS4 Pro, Dualshock 4 and PlayStation camera. You’ll also be able to get the controller individually, as well as a Gold Wireless headset that has the same transparent casing as the console. There’ll only be 50,000 of these available worldwide, and they’ll go on sale in the US and Canada on August 24.